When you land on the island, you will be on Main Street. Go left and talk to the lady wearing red and black. She will tell you she thinks someone is going to steal Edvard Munch’s The Scream, but she won’t let you help. Jump onto the sign next to her and use the windows to make your way to the top of the building. Once you get to the top, there will be a piece of paper on the middle dome next to the red flag. Collect it and go back down to the ground. Go right and enter the Web Browser Internet Cafe. Once you’re inside, to your right will be a French to English dictionary. Click on it and you’ll take a page from it. Exit the cafe and jump up the windows of that building, making your way to the right. On a window next to the balcony will be another piece of the page. Collect it, go back to the ground, and go right, to Downtown. Keep going and go to the Countryside. Go right and there will be a boy holding a balloon and crying. Click on the lady standing next to him and she will say “Mon fils veut un balloon vert!” Using the dictionary page, that roughly means that the boy wants a green balloon. Go to Bobo’s Clown Store in downtown, get the green balloon and go back to the countryside. 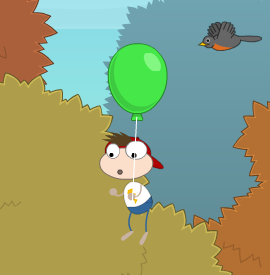 Click on the boy and you will give him the balloon. The balloon will drag him into the sky. Go back to Main Street and go back inside the Web Browser Internet Cafe. Balloon Boy will be on the news, and a man in a blue shirt will be watching it. Talk to him and he will tell you he lost his tunnel tickets. Exit the Internet Cafe and go back to downtown. Go right until you see two trashcans to the left of All That Jazz Cafe. Click on the one that’s open, and sort through the trash until you find two red tickets. Once you find them, go back to the Internet Cafe on Main Street and give them to the man who lost them. He will give you one of them. Go to downtown and go near the underground tunnels. Use your ticket and the girl wearing green will give you admission into the tunnels. Enter the tunnel and go though it until you come to a large dome with a light hanging down. Climb up the light and to your right will be another piece of the paper. Collect it and finish the tour. Outside, you will be at the Docks. A man with a scar will be to the right of you. Click on him and he’ll tell you to help him catch the Scream theif. He’ll also tell you how to help. Go right and on top of a large rock will be another piece of the paper. Collect it and go up onto the same platform as the truck and building. Go left until you see a boat. Jump onto the boat and in the crow’s nest (the tallest part; where people stand to get a good view of their surroundings) will be another piece of paper. Collect it and go back to Main Street. 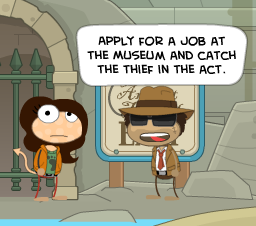 Enter the museum and tell the orange-haired poptropican that you’re “interested in applying for the job.” He’ll tell you to talk to the assistant curator. Go left, up the stairs, and onto the platform to the right. The assistant curator will be wearing a yellow suit. 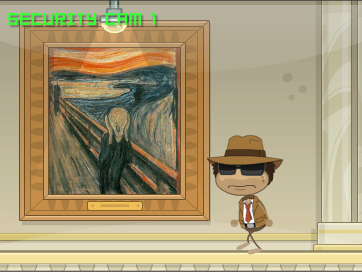 Talk to him, and he will have you put paintings in the right wings of the museum. In the cubism wing, the wrong painting is the one in the middle. Bring that painting to the impressionism wing and click the painting to the far right. Bring the painting you just picked up to the expressionism wing and click the rightmost painting. Bring that painting to the realism wing and click the middle painting. Carry that painting back to the cubism wing. Once you’ve finished, talk to the assistant curator again. He will hire you and ask you to follow him into the forgery detection lab. Once you’re inside, there will be two stations. Talk to the assistant curator and then click on the station closest to you. The first part of this station will be using an x-ray device. There will be five paintings for you to scan with the x-ray device. Once you’ve finished, click painting number four. The next is the magnifying glass. You will have three paintings supposedly by the same artist. Use the magnifying glass to look at the signatures of each painting in the bottom right corner. Next will be seeing what gives away a photograph’s forgery. Click up by the moon on the left side of it. You will be finished at that station. Go to the next station. This one will be testing paint samples. Click on the different chemicals (blue, pink, or green) in the order that the bar shows you for all three paints and you will be finished at that station. After you finish your training, the assistant curator will give you a key to the supply room. Exit the lab, go right, and enter through the doorway that has signs in it that say “Statue Room” and “Security Office.” Go left in the statue room and through the next doorway. Go left until you arrive outside the supply room and use the key. The door will open and the last piece of the paper will be inside. Collect it and leave the museum. It will now be dark out. Go back to the docks and talk to the mysterious man with a scar. Enter the tunnels. Left and up, then right until you see a ladder. Climb the ladder and click on the round thing at the top. It will have a creature on it that you will have to match to the picture you collected to the best of your ability. When you finish, click on the button at the top of the circle. The round thing will open and let you go up. Once you go up, you will be in the supply room. Use the key to unlock the door and go right. Proceed with caution, because if the security lady sees you she will think you’re the thief. Once you make it to the other side, enter the statue room. The statue room will have cameras in it with red lines to show you their line of vision. Hide behind statues and plants to evade them. Once you make it to the other side, go to the next area. Go left and click on the Scream. As soon as you jump onto the light, the chief inspector will come in along with two police officers. She will think you’re the thief and you will be in the next newspaper. Exit out of the paper and you will be in a jail cell. The chief inspector will have you take a lie detector test. Answer every question truthfully. You will pass the test and the chief will tell you that someone else stole the scream last night. She will also tell you to go to the security office in the museum. Once you get there, go right and click on the computer that’s next to the wall. You will start going through footage, but then you will realize that there’s too much to go through and that you need a specific time. Exit out of the computer screen and go downtown, to Bobo’s Clown Store. On the inside, to the left, will be the other security guard. Talk to him and he will give you his time card. Go back to the museum security room and play the footage again, this time starting from when the security guard clocked out. 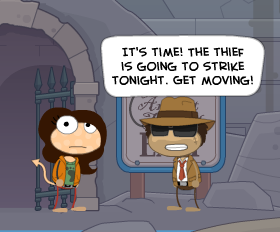 You will see that the mysterious man with a scar stole it! Exit out of the painting and exit the museum. 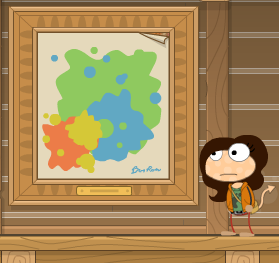 Get on your blimp and fly to Early Poptropica Island. Enter the Pop Art Museum to your left and go left until you see a woman with grey hair and a purple dress. Talk to her, and she will tell you that she is the curator for the museum. She will also give you a key. Fly back to Counterfeit Island and go right. 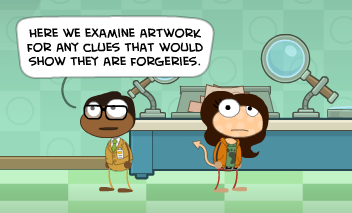 The man standing next to the easels covered in paint will tell you that the inspector suspiciously bought a painting with no frame. Go right, to the countryside. Keep going right until you get to the Inspector’s house. Stand next to the door and use the key that the curator gave you. You will be allowed in the house. Once inside, go left and up onto the next floor until you see a large painting. In the top right hand corner of the painting will be a small flap peeling down. Click on it, and the flap will peel down more to reveal the Scream underneath! As soon as you discover it, the lights will go down and some sort of fight will ensue. When the lights come back on, you will be in a new area tied to a chair. 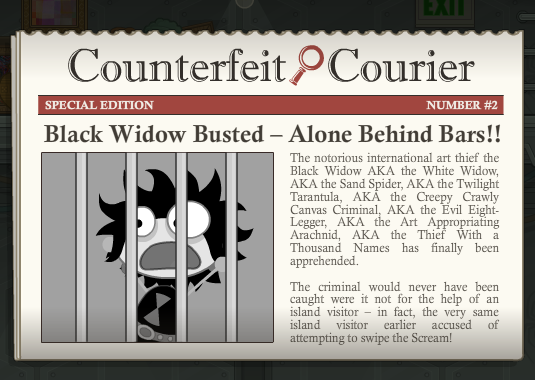 The inspector will reveal herself as the Black Widow, notorious art thief, and ask you where all the valuable art is being hidden. Since you don’t know, you can’t tell her, so she will get frustrated and leave. The mysterious man will also be there. Move your chair back and forth to get to where he is, and he will untie you. Once you are both untied, it will be time for you to catch this island’s villain. Go right and enter through the archway. You will be in a room full of guards. Make your way up the platforms, being careful not to let them see you. Once you get to a large metal door, use the key card that the mysterious man dropped and go through the door. The Black Widow will be on a platform above you, dropping art. Catch all of the art she drops, and don’t let the amount you miss exceed 1 million dollars worth. In certain intervals, she will get mad. While she’s doing this, turn the lever of the yellow platform the mysterious man is standing on to bring him up. Go through this cycle until he is able to get to her. After he takes her down, another newspaper will come up. Exit out of the newspaper, and you will be in the Internet Cafe with the curator. She will tell you to meet her at the museum. Go to the museum and go right. Talk to the curator and she will thank you, show you the priceless art in the secret storage location, and present you with the Counterfeit Island medallion.